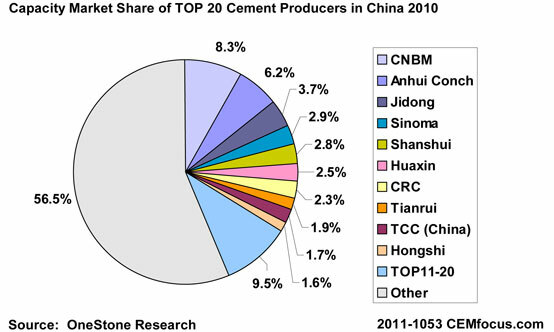 China: CNBM was China's biggest cement producer in 2010 followed by Anhui Conch and Jidong according to newly-released data from OneStone Research. In China the top 10 cement producers comprised 817.4Mt/yr (34%) of a cement capacity of 2.41Bnt/yr. The market leader with a capacity of 200Mt/yr (8.3%) was CNBM, followed by Anhui Conch with 150Mt/yr (6.2%) and Jidong with 89Mt/yr (3.7%). Next places in the ranking were taken by Sinoma Cement, Shanshui, Huaxin, CRC, Tianrui, TCC (China) and Hongshi. Companies in the top 11 – 20 rankings included BBMG, Jinyu Group, Lafarge, Yatai and Asia Cement, combining about 9.5% of China's cement capacity. In total the top 20 companies comprised 43.5% of the national capacity. The only foreign producer within the top 10 besides Holcim (which hold a 39.9% participation in Huaxin) was Taiwan Cement Corp. (TCC) Other major foreign cement producers in China include Lafarge, CRH, HeidelbergCement, Asia Cement Corp., Taiheiyo, Italcementi, Cimpor and Cemex. France/Italy/Turkey: French cement maker Ciments Français has said that it will sell its 51% stake in Turkish Afyon Çimento Sanayi TAS. The French company, part of the Italcementi group, has mandated Mediobanca to be its financial adviser in assessing and carrying out the potential sale of its stake. In February 2011 Ciments Français started divesting assets in Turkey with the sale of Set Group Holding to diversified Turkish group Limak Holding. After the latest strategic move in Turkey, Mediobanca does not rule out that Italcementi may leave markets on which it has minor presence, such as China, Kazakhstan and Saudi Arabia. US: A federal appeals court has scheduled oral arguments for 11 October 2011 in pending litigation challenging EPA's air toxics and criteria pollutant rules for the Portland cement industry, giving activists a chance to argue for the inclusion of greenhouse gas (GHG) limits in the criteria pollutant rule and for industry to highlight what it says are major flaws in both rules. The US Court of Appeals for the District of Columbia Circuit has scheduled oral arguments for the suits challenging EPA's new source performance standards (NSPS) for criteria pollutants and a maximum achievable control technology (MACT) standards for air toxin emissions. The court recently granted the cement industry's request to sever and hold in abeyance several aspects of its pending lawsuits challenging key provisions of the two rules, following an agency decision to issue a partial denial and partial granting of several petitions for administrative reconsideration of the rules. The oral arguments will focus on suits challenging other provisions of the two rules. For example, the Portland Cement Association (PCA) and other industry petitioners will likely ask the court to vacate both rules due to what they say are numerous faults and errors in the final versions. 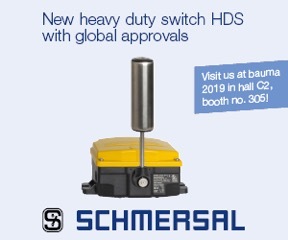 In the fight over the NSPS rule, industry filed a brief on 16 May 2011 taking issue with, among other things, the rule's new limits on particulate matter (PM) emissions, particularly its limit of 4.5g (0.01lb) of PM per tonne of clinker. Producers argue that the EPA 'simply adopted' the same PM limit that it set for the air toxins rule, at odds with Clean Air Act requirements for setting NSPS. In their brief in the MACT suit (16 May 2011), the producers argue that the EPA failed to address the overlap between the cement rule and a recent EPA emissions rule for commercial and industrial solid waste incinerators (CISWI). On 21 March 2011 the EPA issued a memo trying to clarify the number of cement facilities that would be subject to the final CISWI rule but the producers said that the memo did not resolve their concerns and sought to have the question addressed through an administrative reconsideration of the rule. This request was subsequently denied by the EPA. The PCA and others in the industry have also continued to express concerns over whether some cement kilns burning alternative fuels that may fall under a recent final EPA rule defining non-hazardous solid waste would fall under the cement MACT or under the CISWI rule issued in February 2011 and how that would impact on the MACT baseline emissions limits that the agency used when it developed the cement air toxins regulation. The rules were amendments to existing NSPS and MACT standards for the sector and industry only wants the court to vacate the 2010 amendments and not the rules that were in place prior to the new rules. If the court vacates the amendments, the rules could revert to the older regulations, a cement NSPS set in 1988 and the MACT rules from 2006. Environmentalists meanwhile will likely use the oral arguments to push their legal fight that is trying to have the court force the EPA to... ...include GHG limits in the cement NSPS. Environmentalists have filed briefs in the cement litigation arguing that GHGs meet the EPA's two-part criteria for determining whether to regulate new pollutants under NSPS. When the EPA issued the cement NSPS alongside an air toxins rule for the sector in September 2011 it said that CO2 standards 'may be appropriate' for the sector, but chose not to include GHG limits in the final rules, because it had not included GHG limits in the proposed version of the rule. 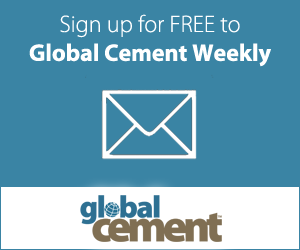 The agency said that it needed, "additional information on site-specific factors that affect performance of these controls, where they are currently applied, and control costs," for reducing CO2 from the Portland cement industry. This is a point that environmentalists are disputing. In a brief issued on 16 May 2011 Sierra Club, the Natural Resources Defense Council and others argue that the EPA's decision not to include GHG limits in the NSPS while saying such limits 'may be appropriate' for future action 'is particularly egregious' given that the EPA's findings in the proposed and final versions of the rule point toward inclusion of CO2 standards and that the agency has already determined that CO2 negatively affects public health. Vietnam: According to figures released by the government's General Statistics Office, cement producers in Vietnam are estimated to have made 18.7Mt of cement in the first four months of 2011, a year-on-year increase of 11.5%. In April 2011 the country's cement output was estimated at 5.5Mt, up by 12.1% on the year. Slovakia: The Antitrust Office has cleared the takeover of Vychodoslovenske Stavebne Hmoty (VSH) by Holcim Slovensko provided that Holcim sells its terminal in Vlkanova in Banska Bystrica County to an independent buyer linked neither to the companies nor to their groups. The watchdog conditioned the transaction in this way because it posed threats to the economic competition on the relevant market specialised in production and sale of grey cement and several local ready-mixed concrete markets. Holcim, therefore, has proposed to sell the terminal. 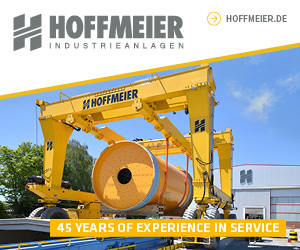 The regulator maintains that the new owner must be experienced and capable of preserving and developing the existing business and it must be able to expose Holcim to efficient competition after it takes over VSH. The decision on a suitable owner will be made by the watchdog. The terminal supplies cement made in the plant in Rohoznik to customers in the entire county.